30yo Black Bull a dream house pet! Busy week behind me, even busier ahead of me. Chris and his Missus are in Sardinia eating and drinking themselves stupid in the sun, and I have whiskies to sample, tasting in Leslie’s tomorrow, a wee charity tasting on Friday, blogging to do, rugby game to play, university work, paid work… But you know what? I shall not complain. 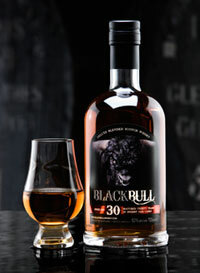 Life is good when drams such as Duncan Taylor’s new Black Bull 30yo are around to pick you up when you fall. Pick me up Black Bull. Now is the time. Nose: Polished wood and chocolate on the top (Fruit & Nut Dairy Milk according to Chris). Further strawberries, pears and heather. Underpinned by a good whiff of gentle (non-Islay!) smoke and distinctive rum sweetness. Mature and elegant. Palate: Forceful, smoky, oaky, chocolaty and berryish. Creamy in texture, super pleasant. Finish: Sweet, juicy and fruity with notes of sticky cocoa and cherries. Later some BBQ bitterness appears. Long and gorgeous. Person: Santa – brings joy and warmth in the most natural way. Despite the slightly dodgy outside. This entry was posted	on Monday, April 20th, 2009 at 12:04 pm	and is filed under Reviews. You can follow any responses to this entry through the RSS 2.0 feed. Responses are currently closed, but you can trackback from your own site.